We measured a selection of these jackets and also tried them on our Fit Check mannequins Huey and Dewey to see how they fit (Huey is in a Euro 52 and Dewey is in a 56) and they both look great. The overall fit is consistent with other European sized jacket we sell such as Alpinestars and REVIT. This product is sold in European sizes. Generally speaking, the US chest size in inches is equivalent to roughly 10 points less than the European jacket size. Example: a 56 Euro jacket is similar to a size 46/XL men’s US size. To choose a size in this jacket, I’d suggest you measure yourself with a tape and get your chest size and belly size, then use the size chart to pick the smallest size jacket that will be big enough for both your chest and belly using the chart below. Approximate US alpha sizes are also listed in the chart so you can check if the jacket size you choose is the same alpha size as you normally wear in men’s clothing. Sizing tips for upgrading armor: If you plan to add a back protector add 1” to your measured chest/belly size before using the size chart. If you plan to add chest armor, add another inch. The overall cut of this particular style jacket is more relaxed than more sport oriented jackets. Its more of a “street cut” so it will be an easy fit for most and comfortable to wear. Wow, here’s a great closeout deal! The Dainese MIG jacket will be great for a wide variety of weather conditions. It has great looks and it is comfortable to wear too. You won’t find a better deal on a sharp sport style jacket anywhere. The torso of this jacket is largely a full mesh material which will allow full air flow so this jacket will work even in the hottest weather conditions. The sides of the torso and the arms are a slightly stretchy Cordura material which makes this jacket more comfortable to wear than most sport jackets that have the same look. The shoulders and elbows have black, washable leather overlays to add abrasion protection and to add some style. And finally there are black metal plates over the shoulder armor. 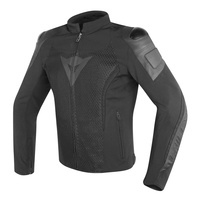 The elbows and shoulders get Dainese standard plastic/foam armor which is comfortable but sturdy. And then you can add chest protectors and a back pad to round out the armor package (take the links below). With all the armor in, this is one tough jacket! I’d recommend the Pro-Armor style back pad for this jacket since it is the most flow through. The pocket for the back protector is mesh on both sides, so with the Pro Armor BP, you’ll still have great air circulation. A full around zipper for connection to pants is also included. This jacket comes with a removable windproof liner you can zip in for cooler weather riding. It will block cooler air off your body so you can be warmer on cool mornings, etc. Dainese says: When it comes to combining the protection of washable full-grain Grid cowhide leather with the durability of Cordura® Comfort fabric and the breathability of mesh, Dainese has led the way, with the Mig leather-textile jacket being a prime example. Standard features include aluminum inserts at the shoulders and Microelastic inserts for a comfortable fit.